Basic assumptions are the bane of science and scientific progress. So many times a basic, innocent conclusion is cast into concrete with minimal to no supporting evidence. The greatest scientific minds are the ones who recognized when a basic assumption is wrong and needs to be changed in order to realign science with the sum of all known facts at the time. This is how Newton, Kepler, Einstein and many others made their breakthroughs. Sadly, the inertia within the crony scientific community usually lashes out at new thinking. Which is why too many times scientific progress has to blaze through using upheaval and animosity (and sometimes oppression). Comfort with the status quo is hard to fight. Scientists who make discoveries reassess every aspect of the assumed known science and determine where it was falling down. When you realize an aspect of a scientific theory is in violation of known facts (usually from other fields of science not so well known in the field in question), you can begin to explore where the truth could or does lie. And you discover new truths from the perch of an open mind. From day one I have looked at the El Niño effect and decided it is impossible for this much heat to build up from solar or atmospheric heating alone. As is usual with the very, very young science of global climate, you should always consider the fact that we have long assumed the wrong cause and effect relationship (e.g., CO2 as a driver, versus results of, warmer temps). It is just as likely (and as I go through this post, becomes more likely) that El Niño is the result of something else, and the atmospheric responses in terms of weather and climate are just that – the response and not the cause. What I walk through below is a myriad of processes that preclude the theory that El Niño/El Niña are driven by atmospheric/solar heating. Which leaves really only one source for the phenomena left, which I introduce through deduction. 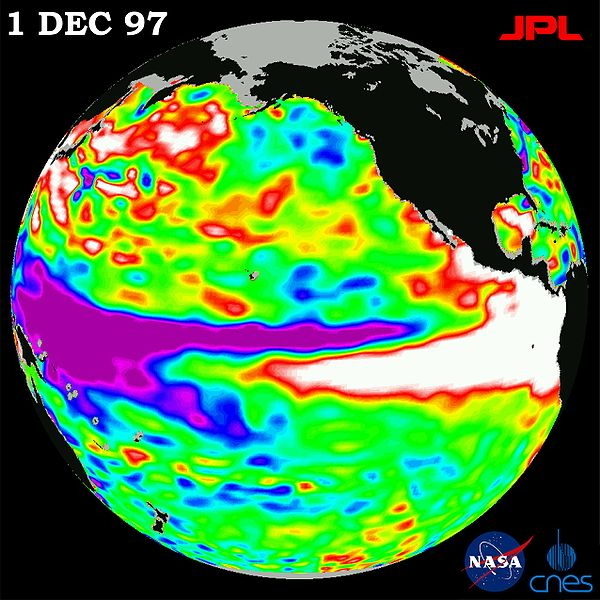 El Niño/La Niña-Southern Oscillation, or ENSO, is a quasiperiodic climate pattern that occurs across the tropical Pacific Ocean roughly every five years. The Southern Oscillation refers to variations in the temperature of the surface of the tropical eastern Pacific Ocean (warming and cooling known as El Niño and La Niña respectively) and in air surface pressure in the tropical western Pacific. The two variations are coupled: the warm oceanic phase, El Niño, accompanies high air surface pressure in the western Pacific, while the cold phase, La Niña, accompanies low air surface pressure in the western Pacific. Mechanisms that cause the oscillation remain under study. The accepted definition is a warming or cooling of at least 0.5 °C (0.9 °F) averaged over the east-central tropical Pacific Ocean. Typically, this anomaly happens at irregular intervals of 2–7 years and lasts nine months to two years. The average period length is 5 years. When this warming or cooling occurs for only seven to nine months, it is classified as El Niño/La Niña “conditions”; when it occurs for more than that period, it is classified as El Niño/La Niña “episodes”. Emphasis mine. With a period of 2-7 years and a duration 0.75 to 2 years, it is pretty obvious this probably is not due to solar heating and atmospheric processes alone. Solar and atmospheric heating show annual, seasonal fluctuations. Also, solar heating has been pretty steady over these time scales, as would be the atmospheric response. So it does not seem to logically follow the kind of phenomena is driven by climate. Gyres are caused by the Coriolis Effect; planetary vorticity along with horizontal and vertical friction, which determine the circulation patterns from the wind curl (torque). The term gyre can be used to refer to any type of vortex in the air or the sea, even one that is man-made, but it is most commonly used in oceanography to refer to the major ocean systems. 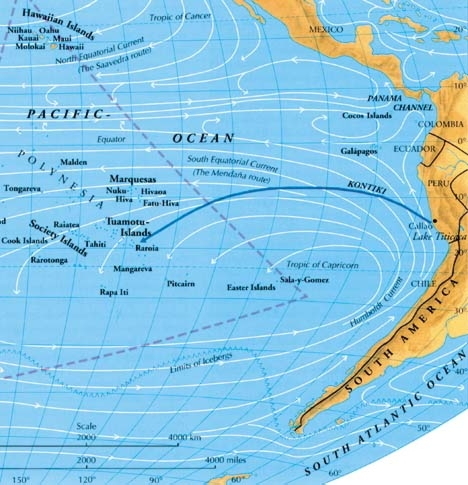 The “South Pacific Gyre” is the Earth’s biggest system of rotating ocean currents, bounded by equator to the north, Australia to the west, the Antarctic Circumpolar Current to the south, and South America to the east. The graph above [click to enlarge] illustrates this massive movement of water. It is these ocean gyres which pull warm water up the east coast of North America (i.e., the Gulf Stream) and Arctic waters down the West Coast. It is why most of us would rather swim off the coast of Virginia in the Summer than the off the coast of San Francisco. In the Southern Hemisphere it is identical. 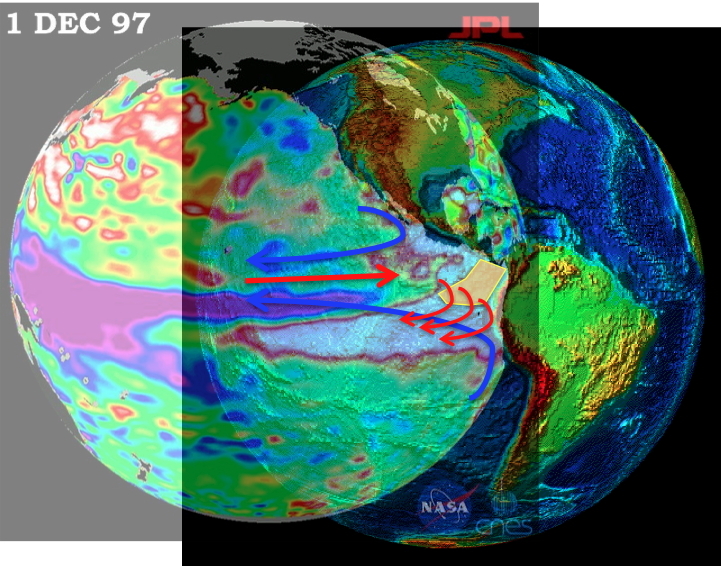 The eastern coast of South America gets warm water pumped pole-ward from the equatorial region, while the west coast has a massive cold flow of water from the Antarctic (noted in the diagram as the Peru or Humboldt current). A great ocean current transporting about 70,000,000 tons (63,000,000 metric tons) of water per second (1000 times the discharge of the Mississippi River) northward from the latitude of Florida to the Grand Banks off Newfoundland. Since the South Pacific Gyre is the largest on the planet, and the Humboldt one of the largest currents, we can use the Gulf Stream numbers as a conservative representation. That is a lot of water – per second! Try heating that on your stove. Now let’s look closer at where the El Niño shows up, which will show us why it is impossible for this to be due to heating in the Western Pacific that then travels eastward to build up off the west coast of the Americas. It is impossible because the theory is swimming up stream of the ocean gyres. If you look closely you can see the hot El Niño phenomena is spreading westward off the coast of Peru. One could see this as building up eastward versus tapering off westward I guess. But when we look at the positions of the South Pacific Gyre currents it becomes clear which direction the water (and heat) is flowing. In order to better see the primary current flows, I added blue arrows for the cold Arctic and Antarctic currents coming down the west coast of the Americas. These then bend at the equator and flow east-to-west. I also added the warm Pacific equatorial flow that runs west-to-east using a red arrow. First thing to notice is how the El Niño hot spot clearly trails off the Humboldt current It is NOT coming off the west-to-east equatorial warm current.The equatorial current is well above the phenomena. To reemphasize, with the polar currents dumping over 70,000,000 gross tons of cold water per second EACH into this area, it is impossible for atmospheric warming to warm this much water. If one BTU is required to warm one pound of water, the number to over power these cold currents is astronomical (and ridiculous). And yes, I have consider the Bernoulli effect of thermal rivers. I think that is what is keeping the warm spot below the west-to-east equatorial flow. So if not solar/atmospheric heating from the west, what could it be? In the graph above we see the incredible warm mass existing below us. The big warning sign ‘not to scale‘ needs to be heeded with supreme caution. The mass of warm metal and rock contained in the mantel and core is 6400 kilometers deep. The continental crust upon which we live is one tenth (10%) that molten column. 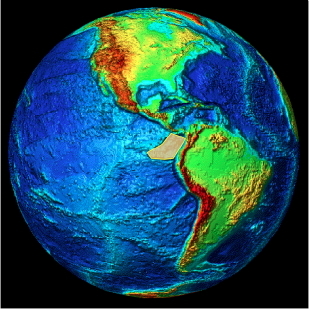 The ocean crust is even thinner at only 1-2% thick (5-10 kilometers). While our sampling of the atmospheric temperature from land based thermometers is poor (25% of the Earth’s surface taken with sporadic methodologies over a short historical time), and our sampling of the sea surface temperatures is pathetic (for 75% of the Earth’s surface with even less data) our understanding of the energy flow from below is as close to zero as you can get. I can say this. It is not even across the globe or constant in time (think Yellow Stone Park). So we have no idea what the energy input from Mother Earth is in or global energy balance. No idea at all. And with this grand ignorance we make sweeping declarations on global climate? But we have much more information on the Earth than we did just 30 years ago. In contrast to the approximately 2 °C ambient water temperature at these depths, water emerges from these vents at temperatures ranging from 60 °C up to as high as 464 °C. Water is a rapid transportation system of thermal energy. It can dissipate heat very rapidly. So if there is any energy source that can rapidly warm cold water from the Antarctic, it is likelyy to be volcanic heat trapped in water at extreme depths. This nutrient rich, super hot water would rise through the colder Humboldt current transferring its heat energy as it moved. The final piece to the puzzle is to now overlay the currents and warm ocean area to see what makes physical sense. Clearly, the integrated view of currents, warm water and volcanic/tectonic structures would indicate the El Niño/El Niña phenomena are more likely to be due to underwater warming from volcanism than anything else. 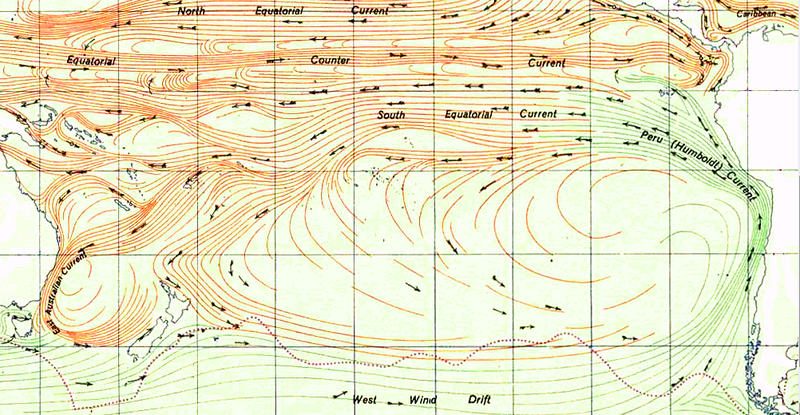 Note how the currents align almost perfectly with the triangle of ridges off the coast of South America. Also note how the equatorial current acts as a barrier for the warm waters to go north, instead bending them back to the south of the Equator. I added more red arrows to illustrate how the Humholdt current would draw the hot water over the triangular ridges away. Also think about the oceanic geography. The ridges form a bowl that could hold much of the super hot water under layers of colder, denser water. As the rate of volcanism rises or continues, the warm dome of water would peak over the ridges and then begin to spread and rise as the Humboldt begins to warm at the equator. This could be the 2-7 year cycle we see. 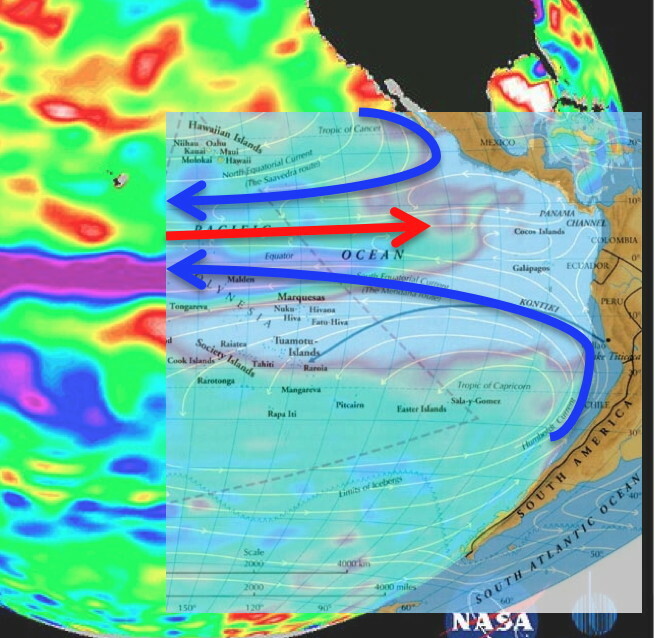 The the pacific equatorial current could be pushing the water into the basin until it overflows. Once enough water is pulled from the bowel, the heating cycle begins. The bowl inside the ridges is the pot, while the black smokers are the gas stove. This makes sense when we look at the duration and cycles of El Niño/El Niña. Volcanic phenomena don’t operate on annual cycles like climate. In fact, this region is one of the most geologically active in the world. Active plate tectonics means massive amounts of energy transfer of all kinds. Again, think Yellowstone, but on a much bigger scale and under water. The physics behind this theory for the El Niño/El Niña phenomena is much more sound than the idea that a ~0.5°C rise in temperature in the Western Pacific air temps can create a 0.5° rise in a current that is moving millions of tons of cold water per second many thousand miles away on the coast of South America. From the view of fluid dynamics, thermal dynamics and geology (plate tectonics) this theory makes much more sense. Do you hear yourself? People who don’t “understand the truth are basically the people that tend to support Romney.” My God what a righteous person you are. I knew there was some undercurrent for your dislike of Romney. Forget RDS, it goes deeper than that. It has nothing to do with Romney and everything to do with you. I truly don’t want to be mean but I’m stunned at your comment. Please think about it. Someone disagrees with you so it automatically follows that they don’t understand THE TRUTH. Please stew on that for a while before you respond. You’ve set yourself up as the arbitrar of the truth and that alone should be enough to scare you. 2005 Romney vetoed a MA embryonic stem cel research bill on the ground that embryos would be created simply to be destroyed for research. Same year he vetoed a bill allowing “emergency contraception” i.e. morning after pill. 2003 he inherited a $3B deficit. He raised user fees (sort of liberal), cut deductions/loopholes broadening the tax base (moderate), and cut tax rates (conservative) to balance the budget. Romney’s problem is that many of the things he did were “moderate”. So you can look at a piece of the puzzle and say it was conservative but look at another piece and say liberal. But given he was Governor of the most liberal state in the country did you really expect he would be a right wing standard bearer. So I can choose to look at his record as that of a weasley lying politician or as that of a moderate/semiconservative guy who did the best he could in trying circumstances. I choose the later. Q: Would Ronald Reagan have been a successful conservative Governor in Massachusets? A: Trick question – RR could not have been elected in modern day MA. In this scenario, CP obviously did not read and/or understand what AJ’s post was about. He then proceeded to pretend what the ‘truth’ according to him really was. My observation, and I stand with it, is that this is typically the modus operandi of the people that support Romney. They pretend that the truth is what they want it to be, regardless of what the truth really is. I also said that just because I said this about Romney and his supporters does not mean that it doesn’t also apply to other politicians and their supporters. the best (or worst) example I’ve seen in this whole thing is the attempted re-writing of history as relates to the relationship of Newt and Reagan. The truth is they were fellow conservatives. The Romney view is that they may as well have been opponents. Patently dishonest. One further point, Romney is strongly protesting Newt referring to him as pro abortion. It is well known that during the 2008 campaign, Romney was NOT pro life. He has had a recent conversion on this issue. So can we get back to my original point? How about leaving politics out of S&T discussions unless they is relevant to the issue? So far no one is proposing legislation based on AJ’s theory. Even if CP is a “volcanic activity warming bowl” denier Romney has nothing to do with it. FYI: Robert Felix has been writing about this for more than a decade. Visit his web page and see that he believes that underwater volcanoes are involved in heating the oceans and hence the weather: or [http://www.iceagenow.com/Ocean_Warming.htm].